There are a lot of new users coming lately to this blog and some of them do not know what to do with the pen in their brand new Surface PRO 3. So here is a note which only purpose is to show one of those cool things that you can do using the pen: Send handwritten emails. Outlook detects the Pen and enables a new option in the Tool bar called Ink tool. That allows you to write emails like the one in the next screenshots. OneNote is a free tool that makes me want to go back to school. 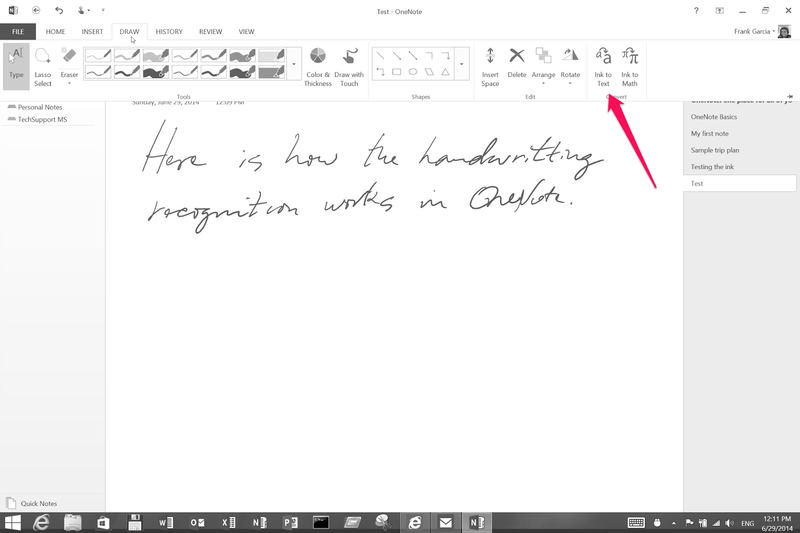 It's so easy to use and now with the Surface Pro 3 it's even better. There is a lot of debate about Microsoft's claim of this being the Tablet that can replace your laptop. And those that do not understand the claim just think about Panay' word "lapability". I invite those to forget for a day or two the keyboard and use it a little more as a TabletPC. 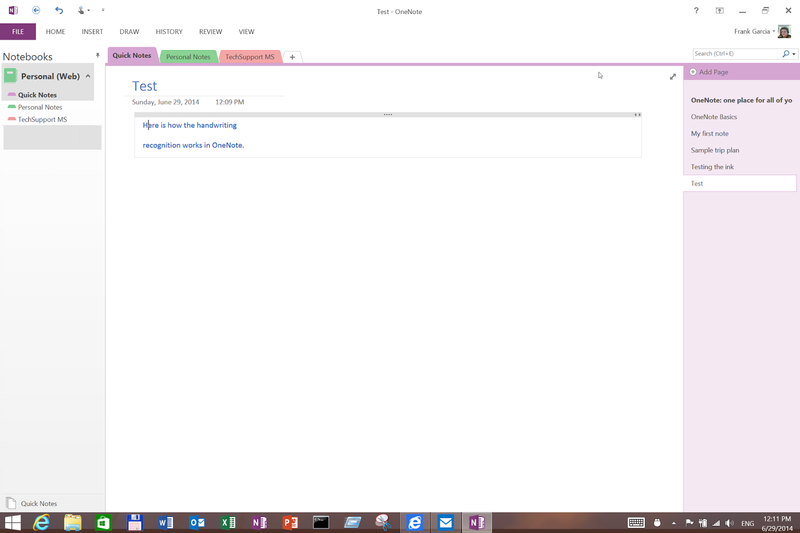 And here is where OneNote comes in your help. 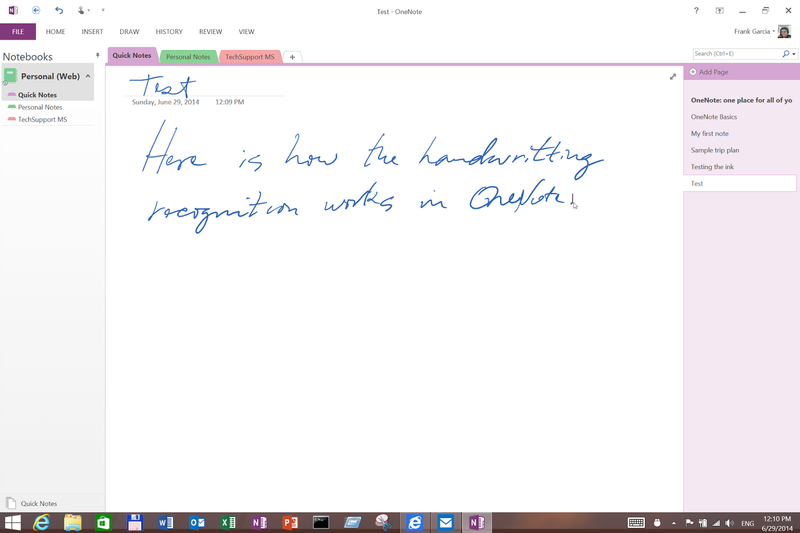 You can take note using your Pen in OneNote and later on if you whish you can convert these notes in printing letters. Here are 3 screen shots that show how that's done. Here is a short note. Even the title is in cursive. 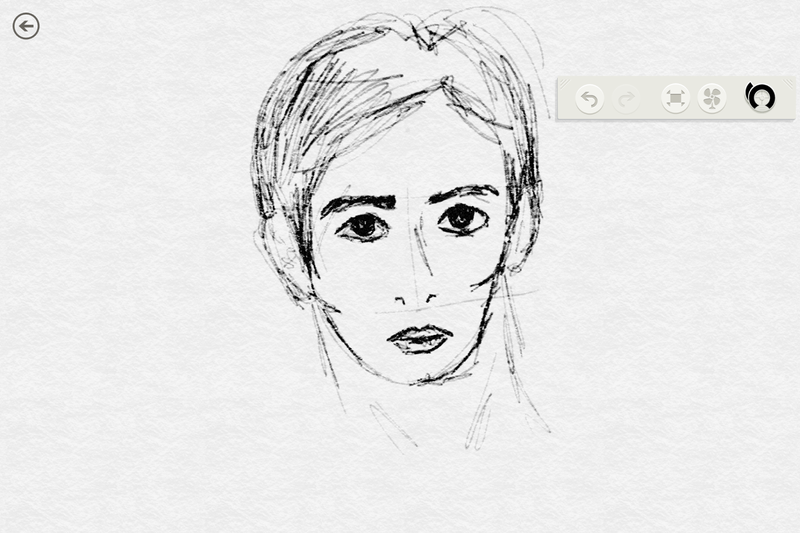 Open the Draw menu tool bar. And click in the marked with an arrow icon. And watch the magic moment. Everything including the title is converted! You never know when you are goring to need it or if you are ever going to need it. But without any doubt it's a good idea to have a way to recover your Surface PRO 3 from a USB memory stick. But for that you need to create a Recovery USB stick and this is how it can be done according to Microsoft's Surface site. 1: Connect the power supply to Surface and plug into an electrical outlet. 2: Insert your USB drive into the USB port on your Surface. 3: Swipe in from the right edge of the screen, and then tap Search. 4: In the search box, enter recovery, and in the search results, tap or click Recovery, and then tap or click Create a recovery drive. 5: In the User Account Control dialog box, tap or click Yes. 6: Tap or click to select Copy the recovery partition from the PC to the recovery drive, and then, tap or click Next. 7: Tap or click the USB drive you want to use, and then tap or click Next. 8: Tap or click Create. The recovery image and necessary recovery tools will be copied to your USB drive. Your Surface must stay awake during the copy process, which will take 10 to 15 minutes. Tap or click Finish if you want to keep the recovery tools on your Surface. Tap or click Delete the recovery partition if you want to remove the recovery tools from Surface and free up disk space. To confirm, tap or click Delete, and when removal is complete, tap or click Finish. 10: Remove your USB drive from Surface and keep it in a safe place. It's best not to use the recovery drive to store other files or data. Yom will need a 8 GB USB stick because the recovery files use a little more than 4GB. I thought that this wonderful feature was missing from Windows 8.1 but it's not. The Surface Pro 3 comes with a high DPI display that looks really good. But no all Applications are proposed to use this hardware feature and when that happens instead a very sharp view you get a blurry view. That's the case with Google Chrome. Of course, who else. But there is a solution explained a this page. Microsoft Surface Team just published A very interesting article with some good tips and recommendations. 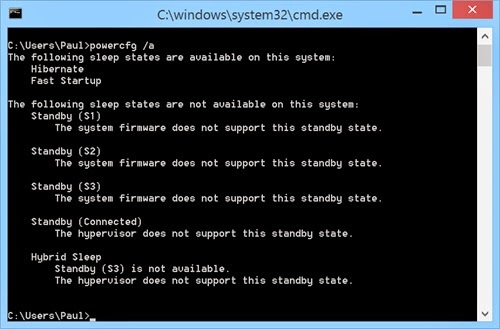 Hyper V could messup your connected standby. I just learned here that enabling Hyper V in your Surface PRO 3 stops the connected standby service, something that you really don't want to miss. Today is June 20th and as promised Microsoft has released the Surface PRO 3. But what probably no many users interested in this device knew is that BestBuy also started selling it today. One of the many marketing mistakes that MS still does. 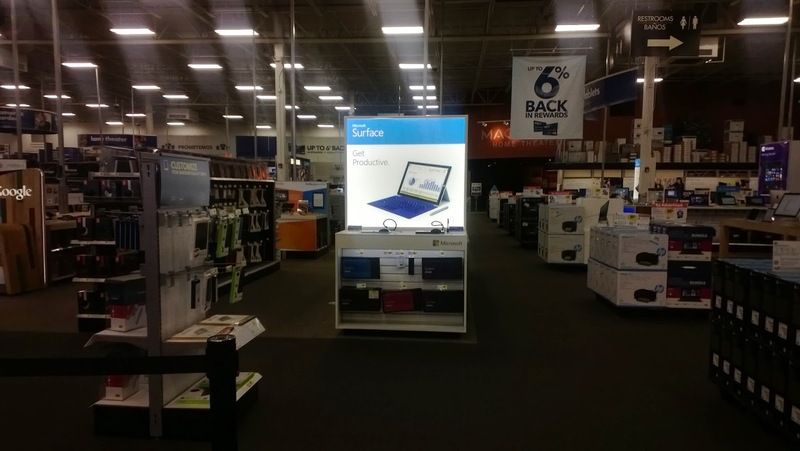 One of the advantages of buying the Surface PRO 3 at BestBuy is the wonderful trade in program that this store offers. 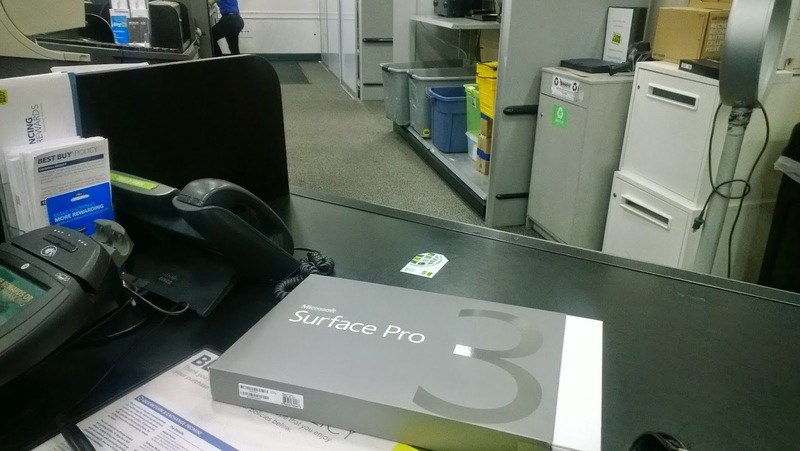 I brought my Surface 2 and received a $263 gift card that I applied against the purchase of the Surface Pro 3. Here is a funny video that shows why is better to buy a Surface PRO 3 than an iPad.